Indoor plants hanging from the ceiling with cascading twirly vines make my heart flutter. Honestly, I didn’t always love plants ( I know, right? shocker). I can remember both my grandmothers having extensive plant collections that required a lot of watering and care. They had them everywhere, and in the late 80’s when indoor plants went out of fashion, I would look at those long vined gnarly houseplants and cringe. Well, how times have changed. Houseplants are the all rage again, and people are clamoring to bring a bit of the green inside. I’m one of them. In the past few years, I have become enamored with gardening both inside and out. Who knew? I just picked up three indoor hanging plants to replace the ones I had to give up when we moved. They happen to be three of my all-time favorite house plants. Soon I am going to be known as the plant hoarder, and I’m ok with that moniker. There are so many indoor hanging plants to choose from, from ferns to succulents, big leafs plants to small ones, it’s hard to know what’s going to work in your space. When we were apartment dwellers, I had three plants that no matter where I put them, no matter what I did to them, they always seemed to keep keeping on. I call them the unkillable and in our apt where bright windows were not the norm these three little guys thrived. One even lived in our bathroom that had NO lights. 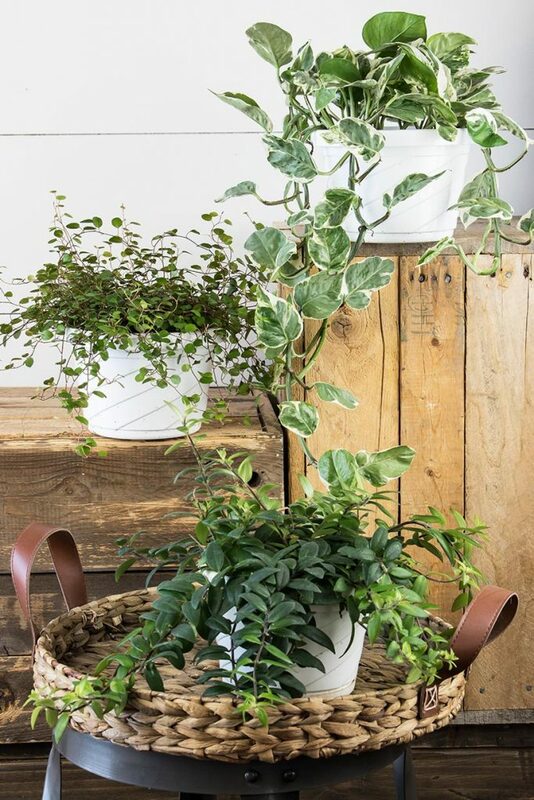 If you’re looking for hardy hanging plants, these three are at the top of the list for ease of maintenance and beautiful vines. My first favorite is the low light champion Pothos Pearls and Jade plant. 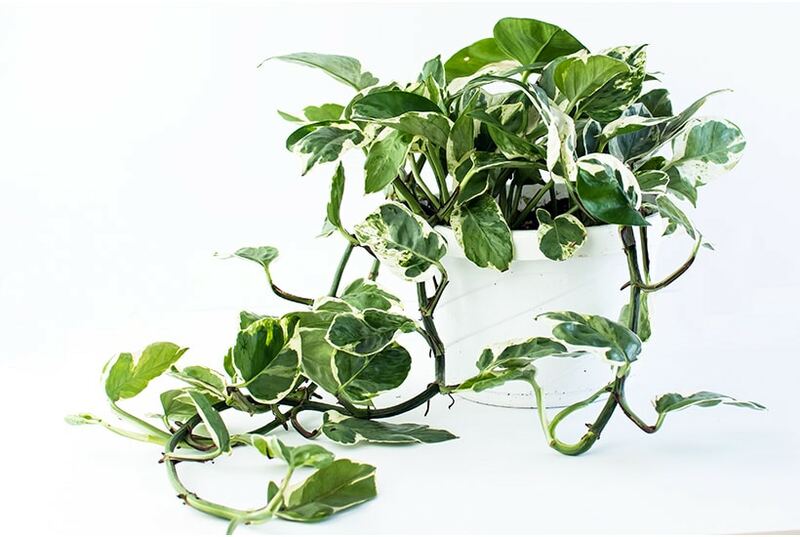 Pothos is a popular hardy indoor plant that will grow and vine everywhere if you let them. The Photos Pearls and Jade has a beautiful leaf in shades of green and stripes of cream. Pearls and Jade put out long cascading vines making it a perfect plant for a hanging basket. You can also train the vines to climb, but I think this plant looks it’s most beautiful with vines tumbling down. This plant does need a tiny bit of light. Without any light, Pearls & Jade will lose the cream color in new leaves, and the entire plant will turn a deep green. You don’t want to put it in direct light, but a bit of filtered light from a window will help this plant keep its beautiful coloring. Propagation of this plant couldn’t be easier. Just snip off a 6-8 inch vine and take off the lower leaves. Place the stem in a glass of water, and when the plant starts to throw out small roots, it’s time to plant it in the soil. Oh, and pothos plants are one of the BEST air cleaners. They remove xylene, benzene and carbon monoxide from the air. They also remove formaldehyde, which makes it a perfect plant to put in a freshly painted room. To promote lush new growth, don’t forget to fertilize bi-monthly and give your pothos plant a light pruning every few months. There is one caution – this plant is toxic if ingested. It is not recommended for pet owners, especially if your little furry friends like to munch on plant leaves. Water regularly, but allow the soil to dry out before watering again. Don’t let your pothos rest in standing water, drain off any excess. This little guy doesn’t like the cold – temperature should stay above 15 C or 59F. Prune every few months to avoid legginess and promote new growth. The Mira Lipstick plant is a lovely flowering indoor hanging plant with thick leaves and unique bright red flowers that are ideal for hanging baskets. This tropical houseplant is beautiful when fully bloomed. Although it will tolerate lower light levels, it will not bloom without adequate sunshine. So make sure you pick a bright spot for your lipstick plant. The more light you provide, the more blooms you will have. Mine hasn’t yet bloomed, but this is what it looks like in the dead of a cold northern winter. 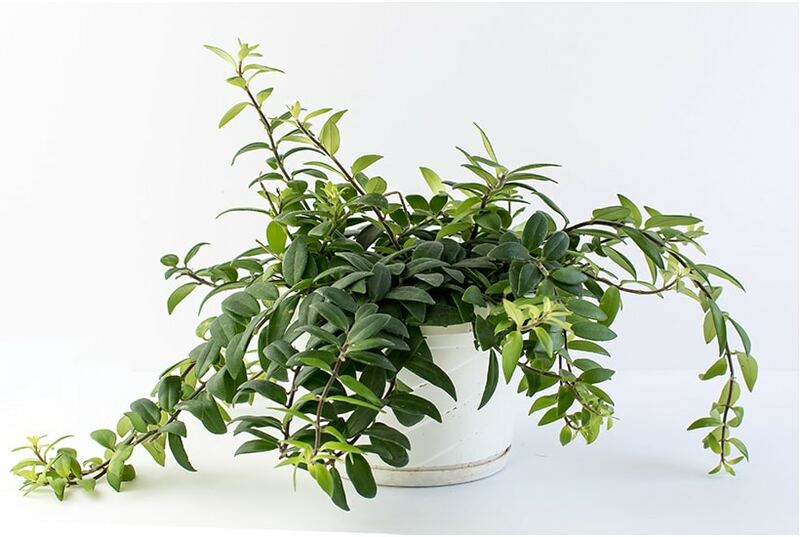 Water your lipstick plant enough to keep the soil moist, but do not keep it soaking wet. If this indoor plant is left in standing water or is kept too moist your roots will rot and your plant will die. Fertilize monthly in spring and summer to keep the plant blooming. I’ve had excellent results with Pro-Mix flower fertilizer, but any general purpose fertilizer will work, just follow the manufactures instructions. 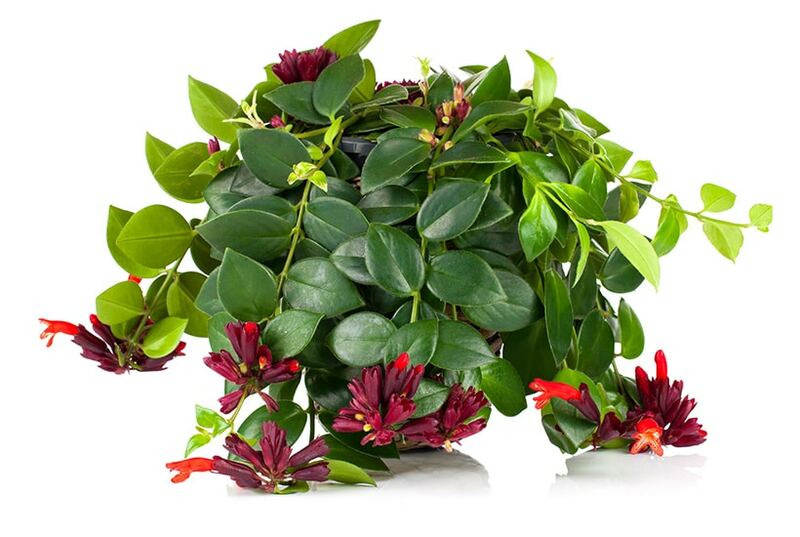 Do not fertilize in the winter – you want to give your lipstick plant a chance to rest. Prune back stems after flowering. You can remove 1/3 of the plant to prevent it from getting leggy. Pruning also encourages new growth and more blooms! These indoor plants are real showstoppers when they are in full bloom. Lipstick plants are tropical, and they like high humidity. If your indoor humidity is low, you can help your plant along with regular mistings from a spray bottle. Caution: This plant is toxic if ingested. Not recommended for pet owners. Low to bright light with some direct sun in winter. Keep humidity high; a spray bottle mister works well to keep this plant healthy. Feed once a month with a balance plant fertilizer. Isn’t she pretty? The Maidenhair Vine with its small leaves and trailing habit make an excellent choice for hanging baskets. This indoor plant is full and lush with tiny dark leaves and is an impressive looking houseplant. Fully grown these plants look spectacular. To keep your maidenhair vine happy, keep it near a bright window. This is the indoor plant you want to hang in front of your windowsill. The maidenhair can tolerate lower levels of light, so if you don’t have a bright window, you don’t have to give up on this beauty. With less light, your maidenhair vine will grow slower, but it will not die on you. I had this indoor hanging plant in my home office, and although there wasn’t a lot of natural light, it did very well. Water your maidenhair vine when the top inch of soil begins to dry out. Try not to overwater and don’t leave your plant in standing water. 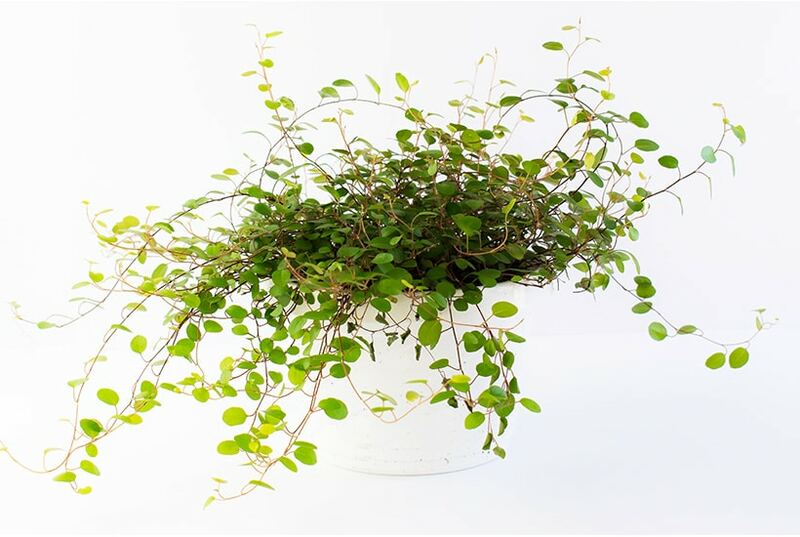 The maidenhair vine is not a hungry indoor plant, and you do not have to fertilize it often. Fertilizing once a month during growing season is adequate to keep your plant healthy and happy. To propagate, take a cutting with at least three leaves. Leave your cutting in a glass of water, and once you start to see the tiny root shoots, it’s time to plant in soil. This indoor hanging plant is not toxic to humans or animals but is inedible. <- who is eating these things that I had to tell you this? Bright light is best but will tolerate lower levels of light. Fertilize once every month during growing season. Keep soil evenly moist, but not soggy. Prune back if the plant starts to look leggy. 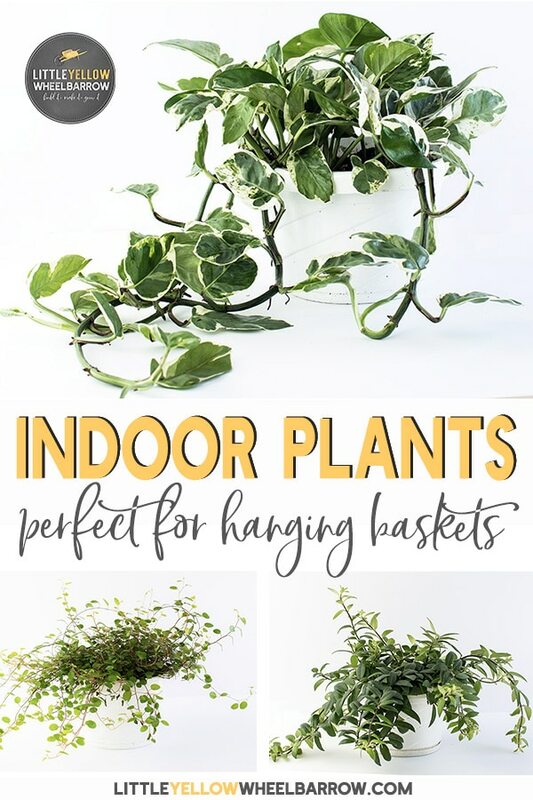 So find some indoor hanging plants and enjoy them! These three recommended houseplants are easy to care for, are not fussy, and can get by with a bit of neglect. I’ve had success with them in the past, and now I have new plants to replace the ones I lost when we moved. I plan on letting them grow long and gnarly – I bet my grandmothers would be proud. Oh and one other thing, these indoor hanging plants are CHEAP. I think I picked each one up for under $10.00. I will propagate them too when they get a little bigger and make even more indoor plants. If you have a favorite hanging indoor plant let me know about it, I might add it to my collection.